alaTest has collected and analyzed 40 reviews of Breville Cafe Roma. The average rating for this product is 3.6/5, compared to an average rating of 4.4/5 for other products in the same category for all reviews. Reviews about the durability and design are overall positive. The maintenance and price also get good opinions, but the noise and reliability get negative comments. We analyzed user and expert ratings, product age and more factors. 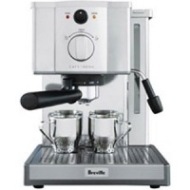 Compared to other products in the same category the Breville Cafe Roma is awarded an overall alaScore™ of 77/100 = Good quality. I will confess that I have not read the included instructions. (I have been making and drinking espresso for 25 years. As a Hungarian, I was raised with the stuff.) Regardless, the machine is a simple as they come; one button and one knob! Tried more than 10 different coffees for espresso machines and 95% of the time no crema. Most of the time it´s mostly water that flows. The only 3 times it worked I had to press the coffee with so much strengh it took me about 2 minutes. So I've had this machine for 2years. The first year I spent in ignorance of shot quality. This past year, after a trip to Italy, I really got obsessed with makng a good shot at home. I've had this for a number of years and am entirely satisfied.